This post is part of our special coverage #Occupy Worldwide. Inspired by the “Occupy Wall Street” movement in New York and by the Spanish “Indignados”, citizens in 951 cities and 82 countries across the world took to the streets on October 15, 2011, to protest against the stranglehold on the economy of the global financial and political powers to the benefit of the few, calling for real democracy and a re-thinking of capitalism under the slogan “united for global change”. 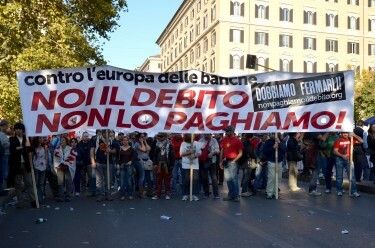 Tens of thousands of people from across Italy gathered in Rome on Saturday 15 October, in support of the global movement. 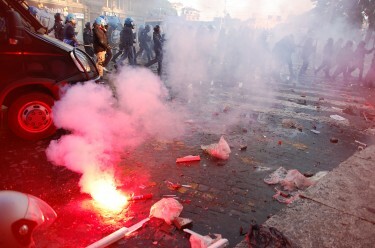 Whilst demonstrations were relatively peaceful elsewhere in Italy, the march towards Piazza San Giovanni in Rome turned into urban conflict as an estimated couple of hundred individuals (“black-blocks”) burned vehicles, smashed windows, and hurled rocks and bottles at police, who responded with tear gas and water cannons. "We will not pay for the crisis debt"
Many peaceful demonstrators were also caught up in the violence as chaos spread on the streets of Rome, with over 130 people injured (mostly police officers) and 12 arrests. As the riots stole headlines around the world, on the Internet people have been expressing their frustration at the way the motivations behind the protests have been overshadowed by the violence. Everybody running, thirsty for violence and vandalism. Who? Journalists, correspondents, the media. As soon as the first car was burning. Ieri a Roma era tutto organizzato fin nei minimi dettagli. C’erano due piazze in piazza. Il movimento democratico che, come nel resto del mondo, voleva lanciare la sua sfida al capitalismo finanziario in modo pacifico e indignato sconfitto da poche decine di irriducibili violenti il cui unico scopo era “combattere”. Nessuno potrà accomunare gli indignati ai violenti. Ci sono stati episodi concreti di condanna se è vero che tre Black bloc sono stati consegnati alle forze dell’ordine. Un gesto importante. Yesterday in Rome everything was planned down to the last detail. The square was divided. The democratic movement that, similarly to the rest of the world, wanted to challenge financial capitalism, and show their indignation in a peaceful manner, was defeated by a few tens of die-hard rioters whose only aim was to “fight”. Nobody will draw parallels between the “indignants” and the violent. There have been concrete episodes of condemnation, if it is true that three “Black Bloc” were handed over to the police [by other protesters]. La rabbia si è espressa, ragioniamo sul domani, su come rendere incanalabile questa rabbia verso un processo politico alternativo a questo sistema. No reiterando i soliti clichè fra i bravi manifestanti pacifici e i cattivi (o gli infiltrati) manifestanti col cappuccio in testa. The rage came out, now let’s look forward, at how we can channel it towards a political alternative to this system. Not by reiterating the same old clichés of the good, peaceful demonstrators, and the bad hooded ones (or infiltrators [sent by the government]). Perchè non sono stati fermati prima? Semplice, perchè fanno comodo alla classe dirigente. Oggi la nostra classe dirigente avrebbe dovuto rendere il conto delle politiche sbagliate nei confronti delle nuove generazioni, ma ha avuto gioco facile nello sviare l’argomento parlando solo degli episodi di teppismo. Why weren’t they stopped earlier? Simple, because they are useful to our politicians. Today's politicians should have been held to account for the policies they implemented, detrimental towards the youngest generations, but their life was made easier as the discussion was diverted to the violence. The violence comes only a day after Berlusconi faced a confidence vote in parliament, won by an extremely narrow margin of 316 votes to 301. A few weeks ago, the rating agency Standard & Poor downgraded Italy’s credit rating, largely due to what they perceived as the inability of the Italian government to implement economic measures to combat the country’s sovereign debt crisis. As the third largest economy in the Eurozone, it is feared that if Italy’s debt should spiral out of control, it could have disastrous consequences on the European economy, and the European Central Bank is putting pressure on the government to implement measures including privatisations and deregulation of the job market. La questione generazionale è semplice: c’è una generazione esclusa dai diritti e dal benessere, che oggi campa grazie al welfare familiare, e sulla quale si sta scaricando tutto il peso della crisi […] Caro Presidente, garantire e difendere la Costituzione oggi, vuol dire rifiutarsi di pagare il debito, così come consigliano diversi premi Nobel per l’economia; vuol dire partire dai ventisette milioni di italiani che hanno votato ai referendum contro le privatizzazioni e in difesa dell’acqua bene comune; vuol dire partire dalle mobilitazioni giovanili e studentesche che da diversi anni, inascoltate e respinte, hanno preteso di cambiare dal basso la scuola e l’università, chiedendo risorse e democrazia; vuol dire partire dalla domanda diffusa nel Paese di un nuovo sistema di garanzie, che tenga conto delle differenze generazionali, ma che, soprattutto, non metta le generazioni l’una contro l’altra: così, in primo luogo, si tiene unita l’Italia! The generational question is simple: there’s a generation with no access to [social] rights and wealth, who today lives off family welfare, and which carries the full weight of the crisis on its shoulders […] Dear President, to guarantee and defend our constitution today means to refuse to pay off the debt, as suggested by many Nobel prize winners; it means starting from the 27 million Italians who voted at the referendum [in June 2011] against privatisations and so that water would remain public; it means starting from the youth and student protests which for several years, unheard and discarded, have been trying to change schools and universities from below, asking for resources and democracy; it means starting from the request for a new system of social securities, that takes into account generational differences, but most of all that doesn’t put generation against generation: this is how we keep Italy united! Rendiamoci conto di una cosa: non ci sarà mai più una “manifestazione nazionale di movimento” che non includa quel che abbiamo visto oggi. Quando si sceglierà quel format, si acquisterà sempre il “pacchetto completo”. C’è una rabbia sociale talmente indurita che non la scalfisce un martello pneumatico, e due generazioni allo sbando completo, derubate di futuro e furibonde, tutte pars destruens, prive di fiducia nei confronti più o meno di chiunque. Let’s face it: no other movement that will take to the streets in the future will be able to prevent what happened today. When we choose that format, it’s part of the deal. There’s a hardened rage in our society that even a drill can’t pierce through, and two generations left completely at their own devices, angry as their future was stolen, arguing against, without any trust towards more or less anyone. The nature and language of the Internet have taught us this as we were learning to use the web, to self-organise, to produce and share information on a daily basis, to speak out for our own grievances and opinions. Yes, not everyone and not without exceptions. 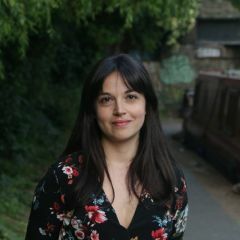 […] But the Internet has taught us, for instance, to establish new dynamics between mass mobilisation and de-localisation. We don’t all have to be in the same physical space to express a shared opinion. 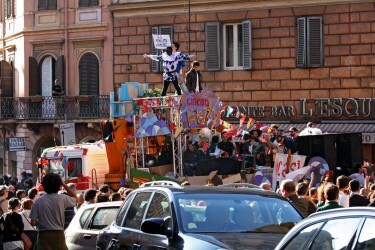 Artists from the occupied Cinema Palazzo parade at Saturday's march in Rome, before it turned violent. E se fosse venuto il tempo di dire addio al corteo come forma di protesta? Alla prossima perché non vi sedete in una piazza e cantate? O qualche altra cosa gandiana e non violenta? Lo sciopero del sale dell'indignato. Spremetevi le cervella o le conseguenze della guerriglia ci travolgeranno tutti. What if time had come to say goodbye to marching as a form of protest? Next time why don’t you just sit in a square and sing? Or some other Gandhian, non-violent thing? The salt strike of the indignants. Think about it carefully, or the consequences of the riots will affect us all. Ma dopo di ieri è chiaro che la scorciatoia di un presidio, l’occupazione di una scuola o un’università, i 140 caratteri di twitter servano a molte cose ma non sostituiscono il lavoro sociale quotidiano, il dialogo con i dannati delle periferie, spesso così disperati da farsi male e far male con la violenza di sabato a Roma. After yesterday, it is clear that the shortcut of a sit-in, the occupation of schools and universities, and 140 characters on Twitter can work in some cases, but they can’t be used as substitutes for daily engagement at a social level, for dialogue with the damned from the suburbs, sometimes so desperate to hurt themselves and others, as with Saturday’s violence in Rome.